The Yamaha Ego Solariz is a 125cc scooter that has become very popular in the country. The Ego Solariz is budget commuter scooter aimed at the youth. Priced at just RM 5234, the scooter has been designed to be lightweight, fuel-efficient and stylish. The engine powering the Ego Solariz is a 125cc fuel-injected and air-cooled unit producing 9.3 hp and 9.6 Nm of torque. The transmission is automatic. 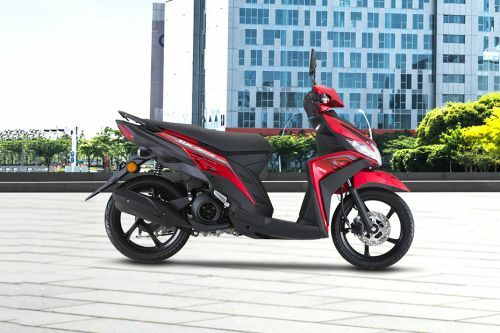 The scooter delivers great fuel economy while also delivering on modern features like good under seat storage space and stylish design with four different snazzy color options. All this at a very competitive price means that the Yamaha Ego Solariz is a very good choice for any young riders who need to commute to and from college. However, the scooter has not seen any recent updates and competition is always getting more intense. Have a question on Ego Solariz? Ego Solariz is available in 4 different colors - Blue, Red, Purple and Margenta. Automatic scooters are a godsend for urban commuters. With a modern lightweight and attractive designs, these have become a favourite amongst women buyers as well. With the launch of the Ego Solariz, Yamaha attempted to stake their claim on the growing scooter market in 2017. Since then it has been very well received not just by the women but men and especially teenagers. Its aesthetics and ease of use are complemented by its versatility and everyday affordability. Seeing this response, Yamaha has tried to keep the scooter fresh with the launch of new color options in 2018. With a price of RM 5234, is this going to be enough to displace the competition of the Honda BeAT, Modenas Karisma 125 and Yamaha’s own Ego Avantiz? These scooters have women and teenagers as their primary target market. Both of which are extremely style conscious. Which is why you get colors like Red, Blue, Purple, and Magenta with its newest upgrade. With its striking digital graphics and dual tone schemes with black plastics, it does cut a pretty picture. The bike has sharp styling. The dimensions of the bike at 1870 mm long, 685 mm wide, and 1035 mm high, give it a slim profile. The pointy apron has an M shaped panel that houses the headlight cluster. With the large angular indicators flanking it on both sides, it gives it a flower like profile. The handlebar cowl gets complimentary angular styling. The side view is equally dominated by edgy panels. From the side, the inward curve of the front apron comes into view which gives it a new dynamic aesthetic. Panelling under the seat gets some additional slashes with otherwise minimal panelling. The seat looks long and roomy. The rear grab handle is also split and angled to make an M shape and looks very dynamic. The sporty black exhaust adds another small piece of aggressiveness to the design. The tail light gets just as stylish a treatment as the front but with stalk-mounted indicators, seems like a missed opportunity. Riding on black 14-inch five spoke wheels, it is shod with 70/90 front and 80/90 rear wheels. Under the seat is a 10-litre storage compartment. It is spacious but is shallow meaning that it cannot store any kind of helmet. It can, however, come handy to store the odd handbag. The conventional instrument panel is newly designed and makes the best use of its large analogue speedometer. Overall an attractive design with good build quality. The suspension setup on the Ego Solariz is conventional to keep the price low. There is a telescopic fork setup in the front and a monoshock mounted to the swingarm at the rear. The ride is soft and pliant. The seat is accommodatingly low at 750 mm and the handlebars are set at a comfortable height. The floorboard has enough space for most average height riders. The lightweight also aids the Ego Solariz’s handling giving it excellent manoeuvrability. Powering the Yamaha Ego Solariz is an air-cooled but fuel injected 125 cc engine. Producing a maximum power output of 9.38 hp at 8000 rpm and 9.6 Nm of peak torque at 5500 rpm, it is mated to a CVT transmission. Being very lightweight at just 94 kg with all its fluids, there isn’t much to move around. This leads to a spirited performance from the get-go. The engine uses Blue Core technology that reduces wastage of fuel giving it exceptional fuel economy figures. These help with making the best use of its otherwise small 4.2-litre fuel tank. The rider is also provided with an Eco indicator on their instrument panel that displays the optimum speed for maximized fuel economy. The smooth throttle response means that keeping the scooter running at this speed is also not difficult at all. The Yamaha Ego Solariz gets a disc brake on the front and a drum brake for the rear. There isn’t much to stop here and these brakes are sufficient. Apart from these, the scooter gets a keyhole shutter to deter thieves. The Yamaha Ego Solariz is a scooter dictated by its price. But that is not a bad thing. It is attractive, decently equipped and very fuel efficient. Its ease of use makes it very well suited for first time riders and women. No wonder it sells in such large numbers. What are the Safety Features Available in Yamaha Ego Solariz? Is Yamaha Ego Solariz available in Electric?